Hey there, friends! Happy July! 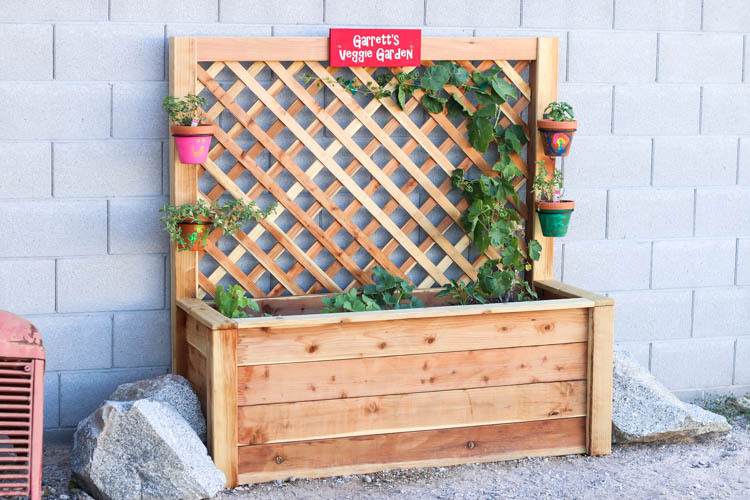 Today, I’m teaming up with RYOBI Nation and sharing the plans for this adorable little garden for kids. They’re also letting me give one lucky ready $300 in RYOBI Power Tools! 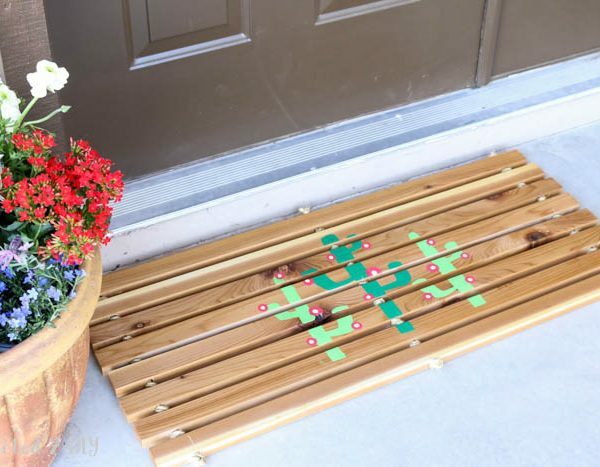 RYOBI challenged several bloggers to come up with a kids’ oasis project for summer. My boys are 9 and 11, so coming up with an idea that would appeal to them was a little tricky. I thought of a play house, but I’d end up burning it down the second I found a snake in it. I kept running ideas through my head until I realized the best people to ask were my kids! Duh! My oldest didn’t really care, so I asked my youngest what he would like and he said he would REALLY like his own garden. 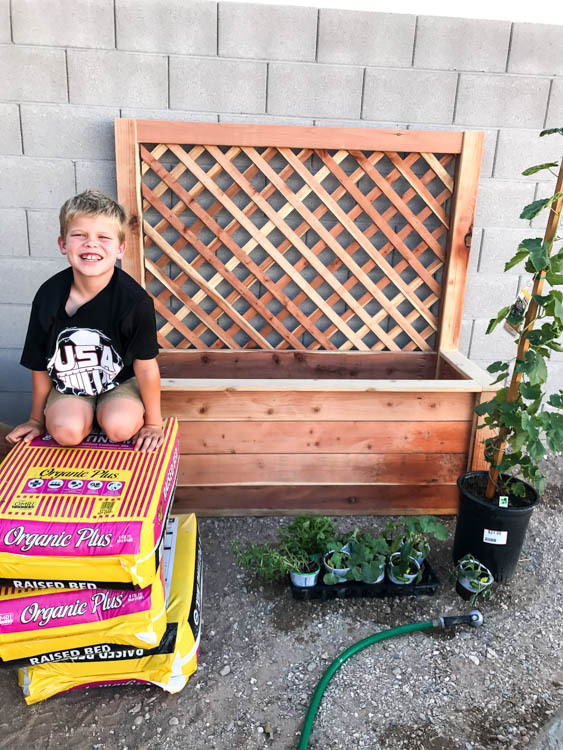 He’s been begging for me to build one for a while and a pint sized garden would be absolutely perfect for him! He’d have his very own little space where he gets to choose what grows in it and care for it all by himself. He even drew out the design! Needless to say, you couldn’t wipe the smile off of his face when we went to Home Depot to buy all of the plants and potting soil. Watching him carefully plan out his garden was so much fun, and what better way to get them to want to eat veggies than let them grow their own! He is so good about tending to it, too! Every single morning, the minute he wakes up, he’s outside watering it. I love how it is teaching him responsibility. 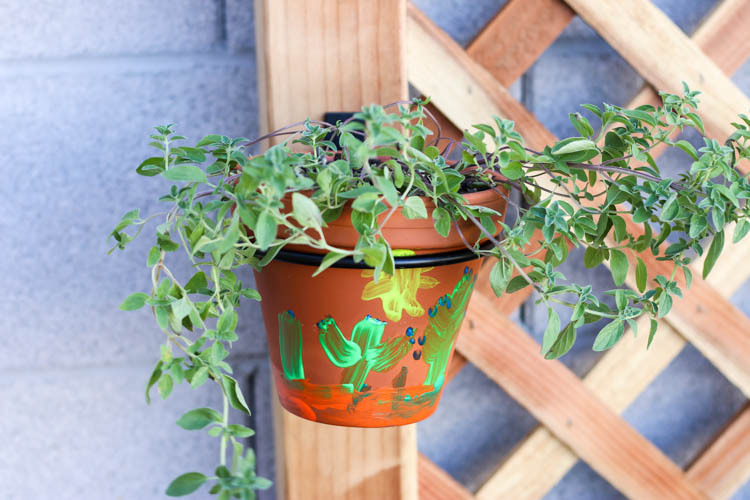 He even painted pots to hang on the garden for herbs. This little cactus one is definitely my favorite. 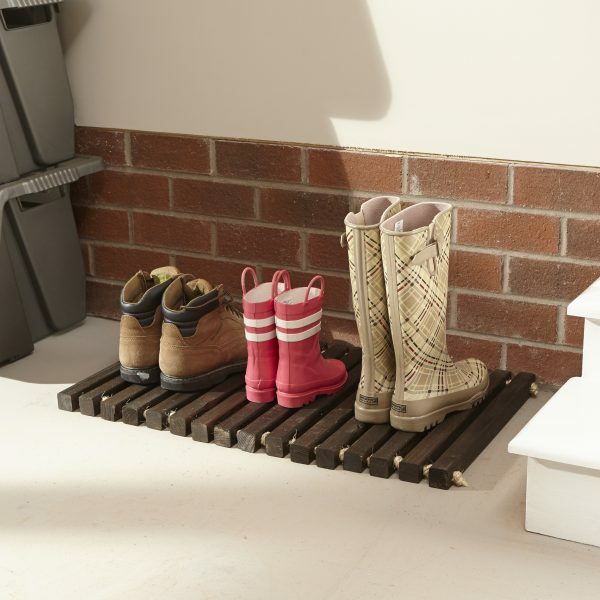 Make sure you head over to RYOBI Nation to download the free printable plans and follow the step-by-step photo instructions to learn how to build one of these for your kiddos! Here’s a hint: July is the perfect month to plant pumpkin seeds for Halloween! Are you ready for the giveaway? Follow the Rafflecopter entry instructions below and you’ll be entered to win $300 in RYOBI Power Tools! Please note that this giveaway is for U.S. Residents ages 18 and over. This giveaway is for power tools only. Good luck! This looks really nice! I believe in the importance of giving kids a platform where they could allot their time and learn something new. I think this is a good idea. Thanks for sharing this! Looking forward to more creative post and I would love to read more about what other projects you do with your kids. Lovely craft! 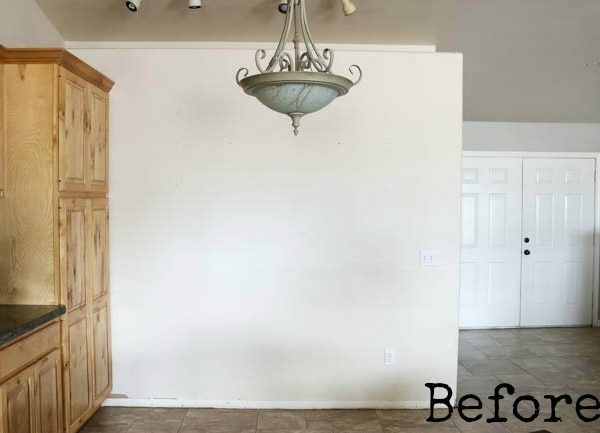 And it’s really perfect for kids, they could even paint it any way they wanted! I love this!! I just planted my very first vegetable garden this year and it has been so fun seeing it grow and getting to enjoy EATING IT! So good. I’m sure he is going to just love seeing everything grow. What did he plant? Thanks, Betty! 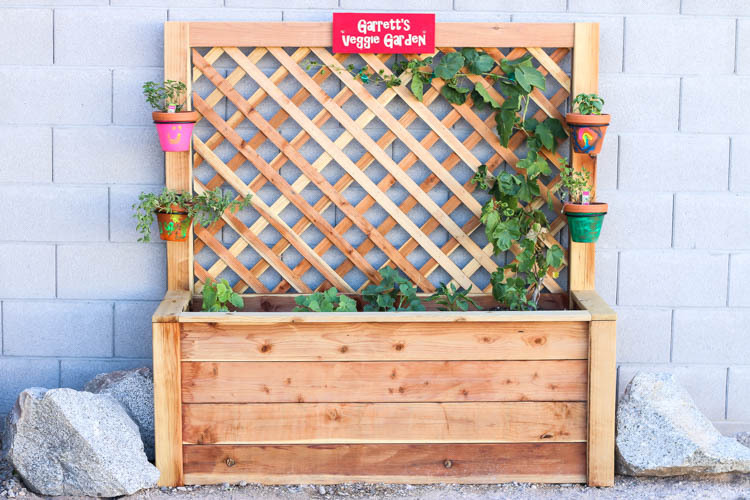 He planted grapes, zucchini, melons, peppers, and cucumbers. It’s been insanely hot, though, so nothing is quite producing yet, but hopefully when the weather starts cooling down a little we’ll start seeing some veggies. I’m thinking of making a ‘grown up’ version! Great job! Thank you! It’s been so fun watching him care for it and he’s so excited for the watermelon and canteloupe that are growing bigger each day. 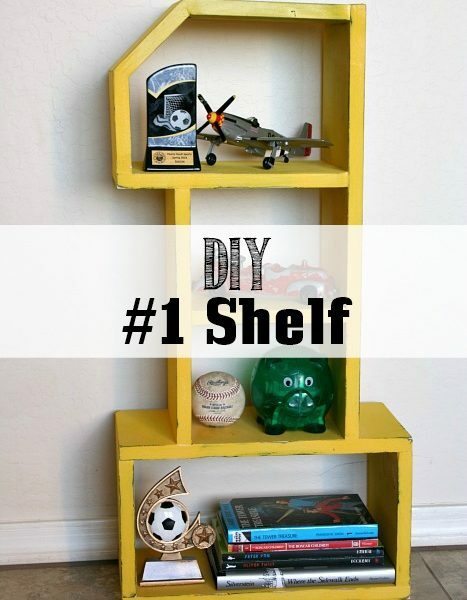 i would love to make one and involve my kids in making one!thank you so much for sharing this! Well done! By looking at his smile, he’s really happy and satisfied. Thanks for sharing this. Sprinkler Repair recently posted…Hello world!